Have you ever priced swimwear? I mean, good quality swimwear for men and boys? It’s not cheap but unfortunately there really aren’t a lot of good sewing tutorials so that you can make your own…until now. I recently thought about making swimwear for my boys and so I started looking around for some easy patterns. I found 10 simple DIY swimming trunk patterns that are perfect for all of the boys in your life. There are patterns in here for everyone from babies to grown men, and all of them are really easy to sew. Some of these can even be made from upcycled materials, like other clothing. If you want to make swimming trunks for the men (or boys) in your life and you want it to be easy, this is definitely the DIY list that you need to take a look at. There are so many wonderful styles in here and all of the patterns are super easy to follow. From board shorts to briefs, you will find a style that is perfect for all of the boys under your roof. And, there are even more great patterns in these 30 DIY summer sewing projects. There is something for everyone in the family. 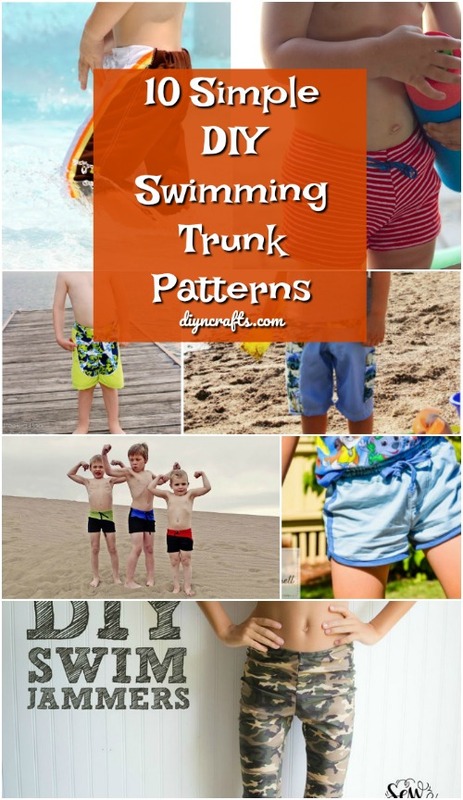 Kids outgrow their clothing so quickly, which is why I love these DIY swimming trunk patterns. You can make a pair of trunks much cheaper than you can buy them so instead of purchasing a brand new pair every year, just take an hour or so and sew a new pair for your little ones. No matter what your sewing skill level, I promise that you are going to find these patterns super easy and your guys are going to love how comfortable these DIY swimming trunks are. Be sure that you also check out these 57 clothing tips and tricks that are borderline genius. Little boys are going to look so adorable in these cowabunga swimming trunks. You can get this pattern on Etsy for less than $8 and it’s a really simple one to follow. If you know quite a bit about sewing, you can probably use the pattern to adjust the size and make these for the grown up men in your life, too. They’re really cute when they are finished and super comfortable, too. These DIY swim jammers are great for avid swimmers, like those on the swim team, and they are much easier to make than you may think. The design of these helps guys to swim faster, so if you have some competitive swimmers in your house, they are going to love these. You can adjust the pattern to make these whatever size you need so this one is perfect for all of the guys in your life. These little comfy looking swimming briefs can be sewn together in a jiffy and your little ones are going to love wearing them. You could likely adjust this pattern to make these larger for bigger boys but they are just adorable for smaller ones. The pattern is really easy to follow and you can use all types of material to make these. They’re really sporty looking and the pattern is perfect for your toddlers who wear swim diapers under their trunks. Depending on the size that you need, you may be able to upcycle leftover fabric scraps to make these. You can take an old pair of suit pants and add in an old Hawaiian styled shirt and make a wonderful pair of board shorts for your men. You could do these in any size, as long as you have the needed materials in that size, that is. These are great and very stylish. Whether they are catching some waves or just hanging by the pool, they are going to love these DIY board shorts and you’ll love how very simple these are to make! These DIY swimming trunks really are the simplest things to make, even though you do them completely from scratch. The drawstring waist is so easy to do and the length can be adjusted based on your needs. If he likes his swimming trunks longer, then just adjust the hem a bit. You are going to be amazed at how quickly you can have these finished and they are perfect for the pool, the lake or the beach. I found this adorable little pattern on Etsy. It’s $9 for the pattern, which makes the most adorable little pair of swashbuckling swimming shorts. The pattern fits 18 months to boys’ size 14 but you could adjust it if you need to so that you can fit the size that you need. I love the three different colors, although you could do these all in one color too if that’s what you want to do. If you buy a pair of swimming trunks in a department store, they are likely to have a mesh lining. 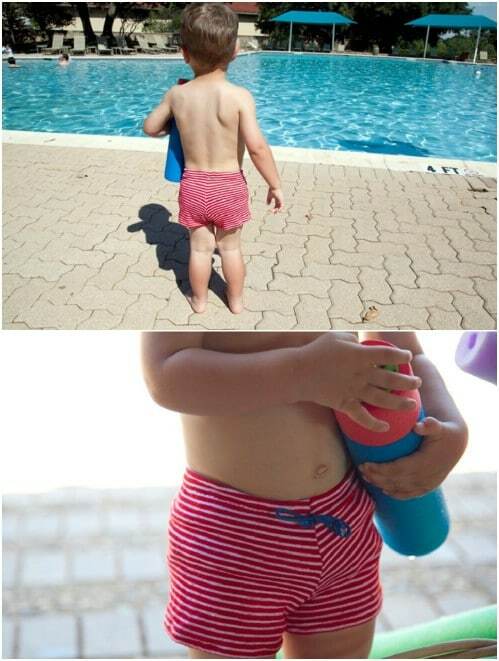 These DIY swimming trunks do, too and it’s really easy to sew in. I love the style of these swimming shorts and your men are going to love them, too. They are super stylish and perfect for everything from the pool to the beach. 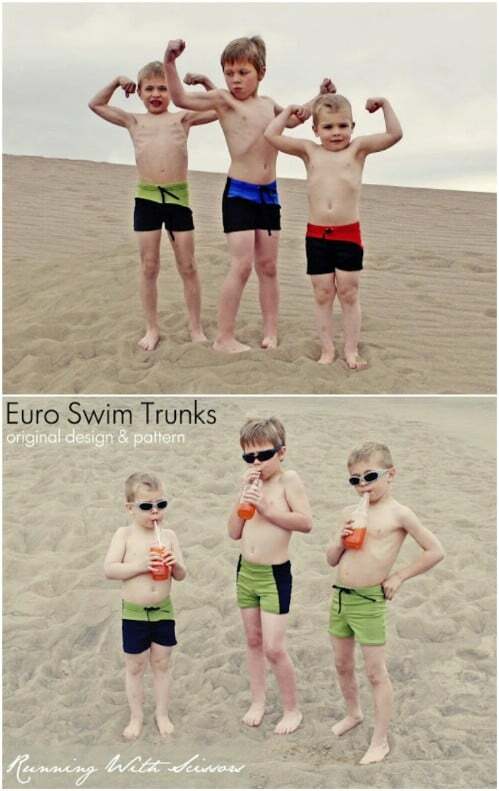 These trunks for boys can be made from upcycled men’s swimming trunks. 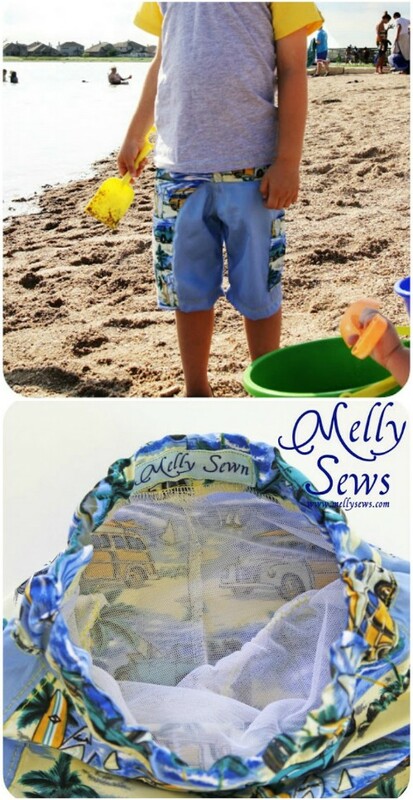 This simple DIY swim trunks pattern is designed for use with a standard sewing machine. That means that you don’t have to have a serger at home. You can make these with what you have. They are really simple to make and have a great style that your boys are going to love. The pattern has three different variations, too. You can make these with a drawstring waistline, a simple waistband and other styles to fit your kids’ personalities. 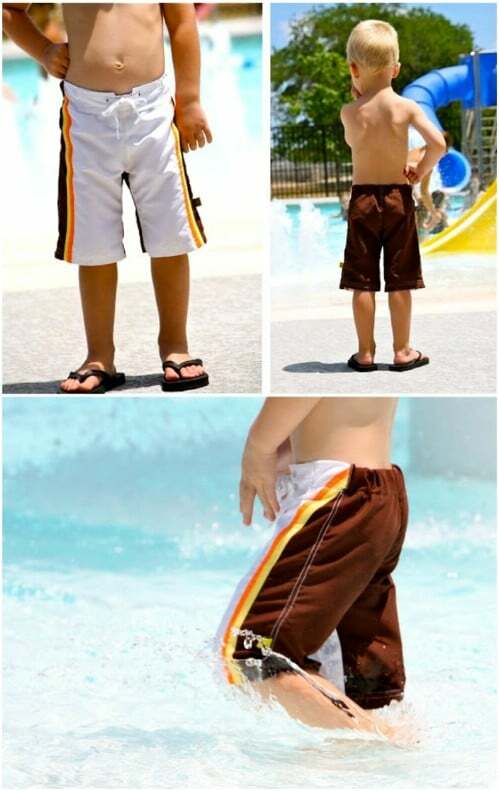 How great would your little guys look in these swimming in your DIY inground swimming pool? 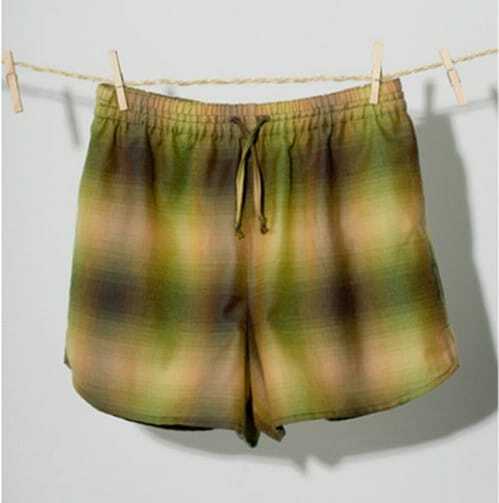 Adjust this pattern if needed to make these adorable little shorts the right size for the larger men in your life. These are so easy to make and they include a sewn in mesh lining. The material choices are perfect in my opinion for heading right out to the beach and the material makes these so comfortable, too. If you need something really stylish for those boys and you want something quick and easy, these are it. These shorts are great for surfing, swimming or just playing around outside. I found this easy to follow pattern on Etsy and it’s just $7.50 for sizes from 2T to 12 in boys. The pattern includes an optional integrated swim bottom or you can leave that out and just sew the shorts. These are so quick and easy to sew up and are really in style right now. These DIY is an amazing bonding with kids. Thank you for sharing these with us!